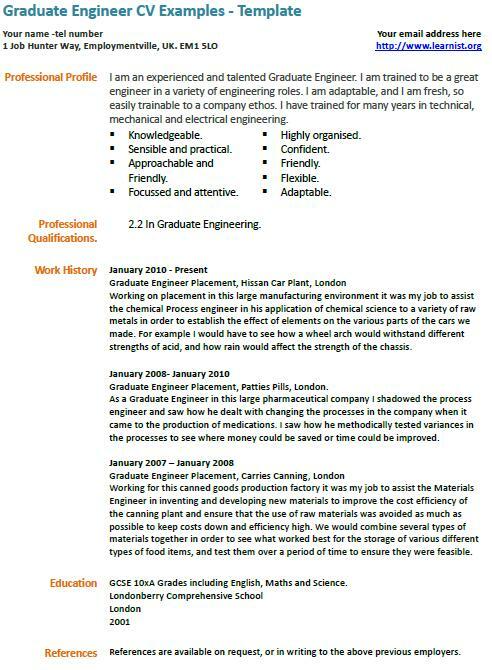 Graduate Engineer CV Examples – Template. You can amend this CV example as suitable and write your own CV in minutes. I am an experienced and talented Graduate Engineer. I am trained to be a great engineer in a variety of engineering roles. I am adaptable, and I am fresh, so easily trainable to a company ethos. I have trained for many years in technical, mechanical and electrical engineering. Working on placement in this large manufacturing environment it was my job to assist the chemical Process engineer in his application of chemical science to a variety of raw metals in order to establish the effect of elements on the various parts of the cars we made. For example I would have to see how a wheel arch would withstand different strengths of acid, and how rain would affect the strength of the chassis. Graduate Engineer Placement, Patties Pills, London. As a Graduate Engineer in this large pharmaceutical company I shadowed the process engineer and saw how he dealt with changing the processes in the company when it came to the production of medications. I saw how he methodically tested variances in the processes to see where money could be saved or time could be improved. Working for this canned goods production factory it was my job to assist the Materials Engineer in inventing and developing new materials to improve the cost efficiency of the canning plant and ensure that the use of raw materials was avoided as much as possible to keep costs down and efficiency high. We would combine several types of materials together in order to see what worked best for the storage of various different types of food items, and test them over a period of time to ensure they were feasible.